This is an extremely scarce Item. This is an ORIGINAL Death Notice card of Lorenzo Bandini. Only a few selected friends of the family received this card in 1967. 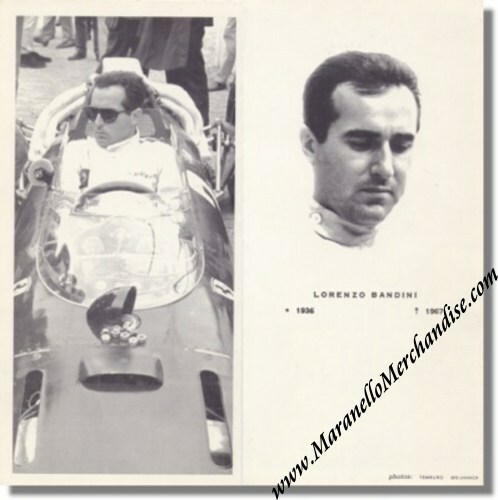 Lorenzo was Enzo Ferrari's "Golden Boy" in the 1960's and is even rumored to be the cause of the break-up between Ferrari and John Surtees. Lorenzo died after having suffered severe burns to his body during his horrible crash in the 1967 Monaco Grand Prix at the age of 31. Lorenzo drove a Ferrari 312 when he lost control over the car in the chicane after which the car caught fire. Lorenzo died three days later in hospital. It measures approximately 20.5 x 10.5 cm or 8.5 x 4 inches and opens up to 20.5 x 21 cm or 8.5 x 8 inches. Price on application only, through THIS LINK.